Heide-Volm is a large and relaxed beer garden with about 1,000 seats located in the Planegg district of Munich, within a short walking distance of Planegg S-Bahn station. The beer garden is partly shaded below trees while a small part of the self serviced area has a roofed veranda providing protection against rain or sun. While the beer garden has a mixed group of guests it can be especially popular amongst the older generation. Some of the beer benches in the self service area have back rests. 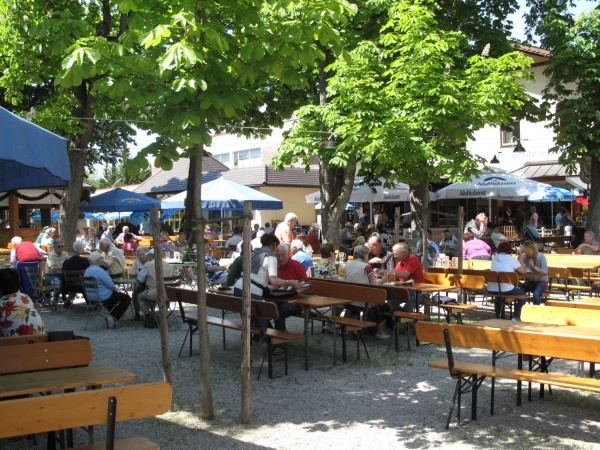 Food stalls offer a wide selection of Bavarian meals and snacks at reasonable prices. The Hacker-Pschorr beer costs €7.50 p/Maß (May 2015). Heide-Volm is well known for its entertainment programmes, such as live bands. An up-to-date events schedule can be found linked via www.heidevolm.de/biergarten.html (in German language). The beer garden is open daily between 11am and 11pm. This page was last modified on 18 May 2018, at 18:42.